"Mr. Repino has developed a refined and powerful technique, a beautiful sound, and a sophisticated sense of style and artistry." - Nicholas Goluses, Eastman School of Music. Born in Philadelphia, Pennsylvania and raised in the south central region of the state, classical guitarist Dennis Repino expressed an early interest in music. While still in elementary school, Dennis began taking guitar lessons with Verlin Vallati in Hershey, Pennsylvania. After high school, Mr. Repino played in a rock band before going on to study classical guitar at the State University of New York at Fredonia, where he earned both the Bachelor and Master of Music degrees under Professor James Piorkowski. During his studies at SUNY Fredonia, Dennis was awarded the grand prize of the 2003 Fredonia Guitar Competition, as well as the Lucia Gracia Bolton, Vincent Morette, and the Robert and Elinor Grennell scholarships, the Dauphin and Trinity guitarist awards, and the Performer�s Certificate. In 2011, Mr. Repino completed his doctoral studies at the Eastman School of Music in Rochester, New York, under the direction of Nicholas Goluses. While studying at Eastman, Dennis was awarded a merit scholarship and a graduate teaching award. Dr. Repino has performed throughout Western New York and Pennsylvania, appearing in concerto, as a soloist, and as a member of the Fredonia Guitar Quartet, the Chadwick Bay Guitar Duo, and most recently the Rochester Guitar Duo with Timothy Shannon. Dennis has performed in master classes with Christopher Parkening, Paul Galbraith, Nicholas Goluses, Martha Masters, Risa Carlson, the Brazilian Guitar Quartet, Eduardo Fernandez, David Tannebaum, and Rodney Stucky. 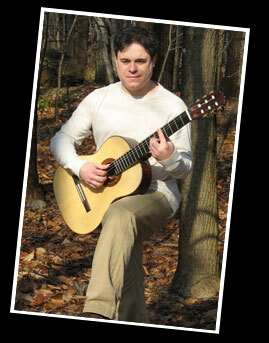 Besides being a performer, Dr. Repino is also a successful instructor of the guitar. For over two decades, students of all ages have gained from Dennis' experience, with many going on to music schools or professional playing careers. Dr. Repino currently holds teaching positions in Canandaigua, NY at Finger Lakes Community College and Mobile Music. Dennis has recorded solo classical guitar music from the Renaissance to the 20th Century and has appeared on numerous local compilations. Dr. Repino is also a published composer and has recorded two compact discs of original works and a CD of holiday music. Dennis records and performs on guitars made by Jim Holler of Jamestown, New York, John Price of Hahndorf, South Australia, and Andy Culpepper of Cortland, New York.